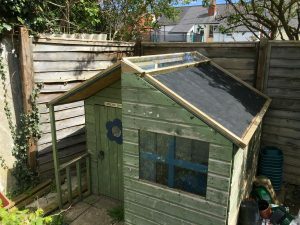 I’ve had a love of plants and gardens for a ‘long’ time and been wanting to create a living roof of my own as I like them and also see it as a challenge because of the unique environmental challenges it poses to plants. It is also one of those great ideas fast becoming more popular and it is something you can involve children of any age in with. Lots of educational and fun opportunities to discuss plants, growing, environments, etc not to mention encouraging outdoor play and getting dirty! And it doesn’t need a garden. Just a location where you can create a flat or slanted surface. Vertical gardens are also possible, but that’s a whole different thing and I’m just discussing my own experimentations with a living-roof. 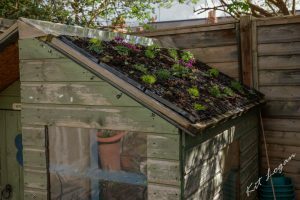 I’ve seen living roofs that varied in size from something only a couple of metres square on top of small, bike or bin stores in gardens to massive ones totally covering buildings. The opportunity for creating a living roof of my own arrived with the delivery of a second-hand wendy house for the children to play in. Structurally sound, but very much in need of a new roof. So I started doing some research into living roofs, what was required, etc, thinking if all else failed I could at least encourage moss and lichens to grow on the roof. Looking at commercial companies who supply ready made living-roofs, considering how much life the wendy house probably had left in it, both physically and that my children will get too old for it one day, the costs involved were just not viable. However, commercial companies do have an advantage, they can supply ready growing roofs…. So what’s the big deal? 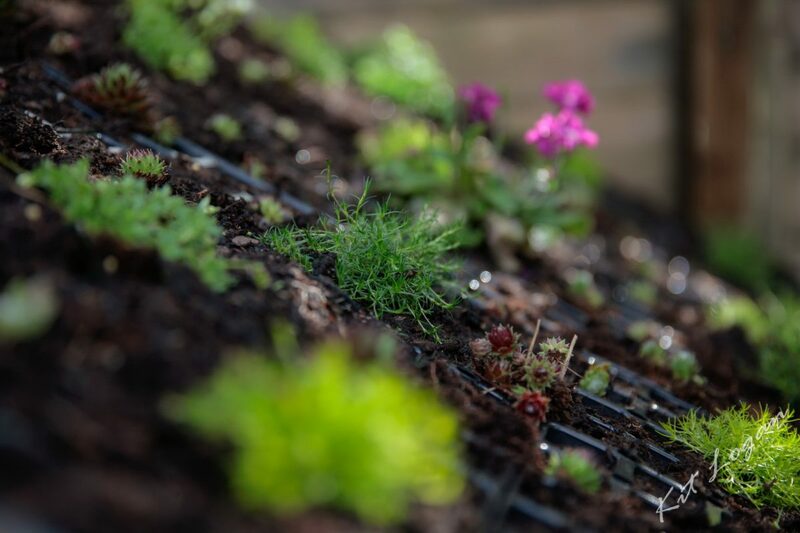 One of the big issues with living roofs is the same with any hill or slanted surface for plants. Soil, unless it’s anchored in some way, will erode away. That’s why you find trees and grasses are often left or encouraged to grow on exposed hillsides so their root systems help anchor the soil and slow down if not prevent erosion. Erosion can happen in a couple of ways, getting washed down or in drier weather blown away. Both of which are possible. This is where ready grown roofs come in handy. They’ve already put down root systems and created a mat like effect, so they are very resistant to erosion. You just put/plant them in place (not quite all, but almost!). One solution to this would be to do this myself. Grow a mat of plants on a substrate and when ready put this in place. It’s a nice idea, but I lack the space and the missus is rather protective of the lawn, so a few square metres of lawn given up for growing a roof covering was not on the cards. Starting and growing the roof in situ it was going to have to be. I’m not detailing every detail here of what you need and/or should do. So please also do your own homework if you are planning on a roof of your own. One important note of consideration is that if you have plants and soil on a roof particularly when wet, they are going to be heavy. 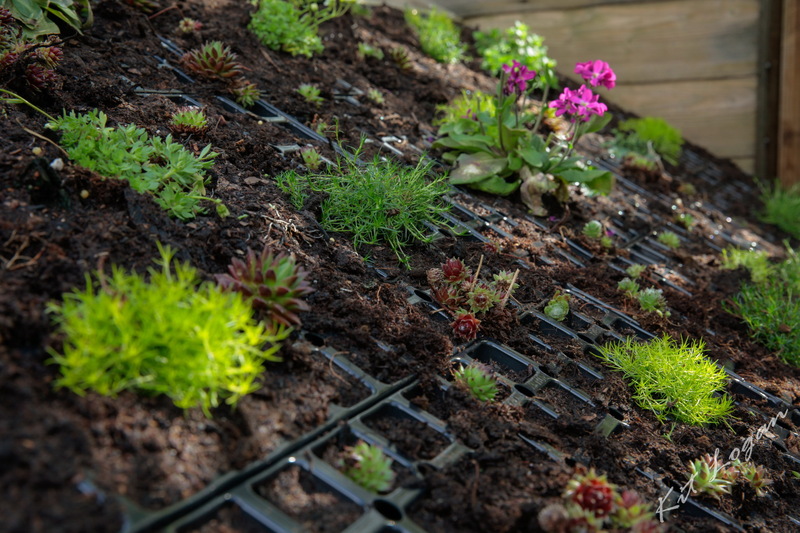 The bigger the roof the greater the weight and depth of soil or substrate on top will also affect this. So any roof needs to be structurally sound enough to take this weight. You also still need a waterproof layer between the roof and plants/soil on top of it then between the plants/soil and roof a layer that will allow water to drain off. Yes, that is a skylight across the top of the roof. Light was only entering via the side windows two of which are in the shade so it felt a little dingy inside, so I set myself a little challenge of designing the new roof with a skylight. It was a fun little challenge. The perspex for it came from an online company who could supply perspex cut to any size. The roof itself has been reinforced with batons on the inside to take the expected additional weight of a living roof. The roof surface has several layers, although with hindsight, with the system I eventually managed to get into place, I only needed the first waterproof base layer which was the essential roof felting. I had overlayed this with a course woven plastic matting to encourage drainage and then over that a weed proofing layer so that the middle layer would not get clogged with soil. Certainly looked better than it did. However, this is when I ran into a large floor in my thinking. I had the idea of running a series of wood batons across the top of the matting to hold soil in place, but the depth of drainage would not be that great once I had put soil on top. I thought it ‘might’ be enough, but wasn’t convinced so started looking for another solution. This is the bit children can really get involved from choosing plants to grow, to planting them out. Planting wise I needed to take into account where the wendy house was which is semi-shade on one side and the other more or less just shade. Considering the small pockets of soil it’s also likely to be drier rather than wetter. So I did my best to look for plants tolerant of dry semi-shade. Ideally, mat-forming. For the shady side, I’ve just bought the seed of some varieties of shade tolerant grass. I’ll see how they turn out. I’ll be happy if anything takes and eventually grows. I might sprinkle some light/small gravel on top to help trap soil from erosion and hold in moisture. I’ll post things as it progresses. I’m happy to learn by my mistakes on this one. Particularly as the current build cost is only about 1/10 of the commercial quotes even for something as small as this.